Culture and organizational performance are inter-related. Organizations that espouse a positive culture on a foundation of shared values have a competitive advantage. Research also shows that people who find their need for meaning and purpose as being met at work exhibit higher levels of performance and expend higher levels of discretionary effort. Culture is also a powerful driver of engagement, which has been linked to better financial performance. How confident can leaders be that their efforts to disseminating organizational culture are reaching all their people? 1. Technology allows more and more people to work remotely, physically removing a portion of the workforce from the corporate or local campuses where people used to congregate. 2. Contingent or “off-balance-sheet” workers are making up a growing portion of the workers – and these employees may not necessarily feel the same investment in an employer’s mission and goals that a traditional employee might. The astonishing fact that emerges out of research is that 95% of new employment in the United States between 2005 and 2015 consisted of alternative work arrangements. An INTUIT report suggests that nearly 40% of all US employees will be engaged in some sort of alternative work arrangement by 2020. A 2015 GALLUP poll revealed that the number of employees working off-campus has grown nearly four-fold since 1995, with one in four employees noting that they mostly telecommute. Thus, we have the reality of the distributed and contingent workforce. Employers face the growing challenge of fostering a shared culture that encompasses all employees, on or off campus, on or off the balance sheet. A consistent culture becomes a great challenge. How can leaders develop a nuanced strategy to extend organizational culture to alternative types of employees? We can segment the entire workforce of an organization along two axes: on vs. off campus; and contract type – on vs. off balance sheet. It is important to recognize that the two axes are not static. Rather, they are fluid to the extent that employees can move from one category to another. The fluidity poses additional challenges for leadership in crafting an appropriate culture. 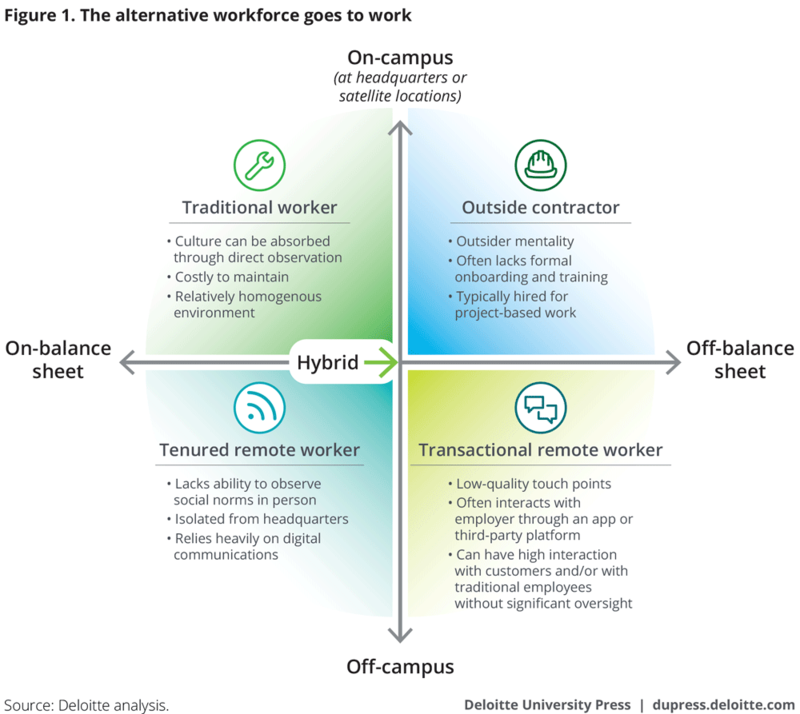 “Hybrid” employees who may alternate between on-campus work and remote locations have some advantages of the on-campus employee, while also facing the challenges of the remote employee. The tenured remote worker. Off-campus but on-balance sheet workers are commonly referred to as teleworkers, but they may also include traveling salespeople, remote customer service workers, and those in other jobs that do not require on-campus accommodations. These workers have the flexibility of location, but are at a disadvantage when it comes to actually observing social norms as well as experiencing in-person collaboration. Research suggests that remote employees often have less trust in each other’s work and capabilities due to a lack of interpersonal communication.16 In addition, remote workers may feel isolated and separated from the company’s headquarters. However, companies still have some traditional levers to pull to engage the tenured remote worker, such as benefits and formal career progression opportunities. Creating a consistent culture across these four unique talent segments requires strategic grounding, as a positive organizational culture is not likely to thrive without focus, intention, and action. While culture may often be viewed as an intangible asset, and even as an emotional or personal aspect of business, using a strategic framework can help bring culture to the forefront of leadership decision making. Just as broader organizational strategy must be crafted deliberately, culture must also be intentionally shaped to make workers feel valued and perform well. Asking a series of questions specifically focused on managing culture can help to guide organizations as they work to sustain and extend their mission amid the growth of alternative work arrangements. Based on the strategic choice cascade—a well-developed framework that is often used to help make intentional decisions about an organization’s strategy—this approach applies similar principles in thinking about how to sustain culture across all four workforce personas (figure 2). What is our culture and purpose? To leverage culture as an asset to organizational performance, organizations must first have a clearly articulated culture—one whose norms and values support the advancement of the organization’s purpose and mission. This may seem self-evident, but just 23 percent of the respondents to the 2017 Deloitte Global Human Capital Trends survey believe that their employees are fully aligned with their corporate purpose. This is an alarming disconnect, with research suggesting that purpose misalignment is a major underlying cause of the rampant disengagement facing many organizations today. A strong corporate purpose—however one defines it—can yield dividends, not just for workforce engagement and productivity, but for the brand and company growth as well. Patagonia, the global outdoor clothing manufacturer, cultivates a positive organizational culture by fostering a sense of commitment, shared beliefs, collective focus, and inclusion. For years, the company has been known for its high-end outdoor clothing and bright-colored fleece jackets. Beyond its products, however, the company also emphasizes environmental sustainability. Sometimes known as “the activist company,” Patagonia’s mission statement reads, “Build the best product, cause no unnecessary harm, use business to inspire and implement solutions to the environmental crisis,” and the company infuses this approach into its work environment. Patagonia’s leadership has implemented and reinforced a culture that motivates employees of all types to play an active role in environment sustainability and live by its mission statement. Employees around the world are given opportunities to participate in programs and initiatives that support the environment; the company donates either 1 percent of total sales or 10 percent of pre-tax profits (whichever is greater) to grassroots environmental groups; and the company takes steps to ensure that the materials and processes used to manufacture their products are environmentally friendly. Through activities like these, Patagonia leaders strive to build an emotional attachment to the company’s mission across its employee base. How do we improve cultural fit? As organizations continue to leverage alternative workers more and more, it will become increasingly important to obtain consistent, high-quality work products from this talent segment. To reduce onboarding, training time, and costs, companies may opt to create a consistent group of alternative employees who work regularly with the organization. Workers who are naturally a good fit for an organization’s culture get along well with the other employees, have a positive experience during their time with the organization, and experience the sense of belonging that can fuel discretionary effort. Therefore, an important step is to screen alternative workers, particularly the transactional remote employees—individuals whose employment relationship was long considered purely transactional—for cultural fit before hiring them. Employers can leverage an array of digital technologies, including video interviews, online value assessments, and even peer-rated feedback, to determine fit throughout the hiring process. Particularly in contexts where teaming and collaboration are important, screening contingent workers for fit during the recruiting process is the first line of defense against diluting an organization’s culture. TaskRabbit, an online marketplace that matches freelance labor with demand for minor home repairs, errand running, moving and packing, and more, understands the value of assessing potential workers—or “taskers,” as they call them—for cultural fit. After seeing early missteps by peers in the gig economy who did not accurately screen or ensure quality of work, TaskRabbit started an early process during the recruiting phase to heavily screen all potential taskers. Now, each tasker goes through a vetting process, which includes writing an essay, submitting a video Q&A, passing a background check, and completing an interview. Additionally, each tasker is reviewed by customers who book his or her services via TaskRabbit’s platform. That feedback helps TaskRabbit ensure that its taskers are demonstrating the company’s desired culture. “The marketplace is all about transparency and performance. You have people out there providing your product that aren’t your employees,” says TaskRabbit CEO Stacy Brown-Philpot. “But you still have to put out there what your values are.” Organizations can use a screening process like TaskRabbit’s, not just for their contingent workers, but for their traditional and full-time remote employees as well. How do we create a consistent employee experience among our unique segments? Traditional workers. Physical spaces can certainly be the most expensive to maintain, but they can also be the most effective in helping to shape an organization’s desired culture. Consider how your organization’s space is designed and what that signals to your traditional workers. Leverage the physical space to reinforce a commitment to your purpose. One financial services firm, seeking to create a culture that emphasized a strong commitment to relationships with advisors and employees, sought to redefine the company’s culture by starting with some low-hanging fruit. Initial activities included dedicating a wall to employee pictures, renaming conference rooms, and reconfiguring office spaces. Over time, town halls were moved from a formal meeting space to an open floor space where employees could easily mingle with senior leaders afterward. Senior leader parking spaces were removed to signify that all workers’ efforts were important to the company’s success. Cubicles were reorganized into team pods to encourage cross-functional collaboration. In addition, the company began a quarterly human-centric award that publicly recognized employees who demonstrated the company’s core values. Utilizing the physical space to create intentional employee experiences helped to reshape the company’s culture around its purpose. Tenured remote workers. Make working remotely as simple as possible for this employee segment. Invest in technologies that support digital collaboration and make working and connecting from off-campus easy. As feelings of being excluded from the goings-on can sometimes plague remote workers, take care to include tenured remote workers when scheduling ad hoc meetings where their involvement would be valuable. In addition, consider creating opportunities for these workers to interact in person with other employees—for instance, through annual retreats or local lunches—to encourage trust and team-building. Lastly, this can be an easy group to overlook when it comes to recognition and acknowledgment of milestones. Openly reward and acknowledge tenured remote workers’ efforts using venues such as company-wide town halls or newsletters. For example, the financial firm discussed above relied heavily on tenured remote employees to fulfill its customer service requests. In an effort to extend the culture beyond the organization’s physical walls, leaders highlighted one remote employee’s exceptional customer service through the company-wide newsletter. This relatively small act of recognition went a long way in helping to reduce turnover within this segment of its employee population. Transactional remote workers. Take the time to understand what these workers are hoping to gain from their temporary assignment, and use this understanding of their needs to build their commitment to your company and its culture. In many cases, transactional remote workers are foregoing traditional worker benefits in exchange for greater freedom and flexibility. Don’t micromanage, but rather, acknowledge their ability to be autonomous and make it clear that you support their flexible work arrangements. In addition, because transactional remote workers aren’t around all the time, Daniel Pink, author of Drive, recommends “spending extra time talking about what the goal is, how it connects to the big picture, and why it matters.”27 Understanding their reasons for accepting the assignment and providing greater context for how their work fits into the larger picture can help leaders better transmit their organization’s culture to the transactional remote worker. The outside contractor. Because this segment of the alternative work population works within your campus, their physical presence can be leveraged to communicate culture through means such as inviting them to all-company meetings and encouraging their participation in lunches or after-work activities. A recent Harvard Business Review article also provides this advice when working with the outsider employee segment: “Try to avoid all the subtle status differentiators that can make contractors feel like second-class citizens—for example, the color of their ID badges or access to the corporate gym—and be exceedingly inclusive instead. Invite them to important meetings, bring them into water-cooler conversations, and add them to the team email list.” Stated simply, don’t overlook these employees working right in front of you and err on the side of greater inclusion in communications, meetings, and company-wide events. What capabilities and reinforcing mechanisms do we need to extend our culture? Leaders should identify both the organizational capabilities and the tools and mechanisms required to help reinforce the desired culture through operations (for example, speed, service, delivery, tools). All aspects of operations should support the desired organizational culture. For instance, if leaders want the culture to encourage continuous learning, they can put in place easily accessible training to upskill employees or reinforce key capabilities or skill sets. Additionally, rewards will come into play as a key reinforcing mechanism; after all, the activities you reward are the ones that employees focus on, so use rewards to reinforce the behaviors that are important to your organization. Airbnb, a home-sharing platform through which travelers can rent a room or an entire home, reinforces culture through a variety of mechanisms. In addition to up-front screening mechanisms of potential hosts, the Airbnb application includes questions about hospitality standards and asks for a commitment to core values that hosts have to agree to support. Airbnb reinforces these values in several ways. First, it has a Superhost program to reward hosts who exemplify Airbnb’s culture. These Superhosts, who now number in the tens of thousands, can earn revenue in the five- to six-figure range; the Superhost designation helps to propel their rentals, creating an incentive that hosts strive to attain. Superhosts also receive a literal badge of honor for their profiles. Airbnb evaluates hosts based on nine criteria, from tactical factors around reliability and cleanliness to the host’s experience, communications with guests, and a number of five-star reviews. These evaluations also help align hosts with Airbnb’s values and purpose. Additionally, Airbnb holds host meetups for knowledge-sharing and community buildin31 For example, in fall 2014, it hosted an Airbnb Open, a conference to “inspire hosts and teach them about making guests feel at home.” The conference ended with a day of community service to reinforce core value. Tactics such as these—from “challenges” like the Superhost program to meetups and events—can be used to reinforce cultural norms and reenergize workers around your purpose. What digital technologies or other tools do we need to extend our culture? Digital technologies offer an array of tools that can enable leaders to share up-to-the-minute information, get instant feedback, and analyze data in real time. Leaders can and should leverage these tools not only to drive collaboration and connectivity, but also to understand the employee experience and its evolution. But don’t limit yourself to just the digital tools. Third-party co-working spaces—such as WeWork, Regus, Spaces (which Regus operates), RocketSpace, LiquidSpace, and a host of city-specific others—can be used to create communities and meeting places where virtual workers, whether on or off the balance sheet, can connect live. An influx of large companies are renting these co-working spaces for employees to create connection points and appeal to a different type of worker. Identify your alternative workforce populations with data. Take an inventory to understand where, precisely, your employees lay within these four populations, to understand how much you need to prioritize thinking about a shared culture and where to focus. Utilize data analytics to determine the percentage of workers in each segment as well as forecast future alternative workforce opportunities. Then review your strategies for how these populations may evolve in the future to ensure your strategy for maintaining a consistent culture remains relevant. Utilize the choice cascade to intentionally create a positive culture across workforce segments. Creating consistent cultural experiences requires an intentional strategy for engaging all worker segments. Just as marketers seek to engage customers under a shared brand experience, albeit through different mechanisms, employers likewise can use the choice cascade to create positive worker experiences under a shared employer brand. Empower leaders to create a positive organizational culture. Commit to supporting the organization’s culture across all levels of leadership. Sustaining a positive culture typically requires great commitment and efforts across all levels. Empower leaders and managers to help workers feel valued and part of a larger effort toward making a difference. This can fuel all employees’ sense of meaning and purpose, regardless of employment type. An organization’s culture can help boost its performance—but to deliver its full potential, culture should extend to all types of workers, not just traditional employees. Given the current and anticipated growth in the off-balance-sheet workforce and in the number of individuals working off-campus, leaders should think about how they can include these workers in their efforts to create and sustain a positive organizational culture. Business leaders who are prepared to directly address this imperative will likely have more success in maintaining a culture that enables their strategy. I recently read an article that discussed how large corporations, such as Amazon, are moving back to the traditional workforce and requiring previously remote workers to work in one of their established offices. Although culture was not a listed reason for that, I wonder how much it impacts the behavior of a remote person, thus affecting their overall contribution to the organization. The trend started with IBM asking all of its employees to be physically present at one of six locations. IBM operates in 120 countries and the move resulted in the disruption of thousands of families. Thus, while technology is an enabler for remote working, the converse is not necessarily true. Physical proximity alone cannot ensure a symmetrical and harmonious culture. Similarly, a few organizations have managed to develop hybrid models that try to leverage on the best of the proximate and remote employees. As new technologies such as AI, Robotics, and the Internet of Things render nearly a billion jobs worldwide redundant over the next decade, it is hazardous to guess where all this would lead us, if anywhere. A constructive conversation at this stage may help mitigate some of the road blocks that we are bound to face along the way.